The FBI has launched an interactive website this week aimed at preventing young people from being recruited online by terrorist groups. The website has been criticized by some Muslim civil rights organizations and counterterrorism experts invited to review the program after they learned the program was aimed at schools and community leaders. 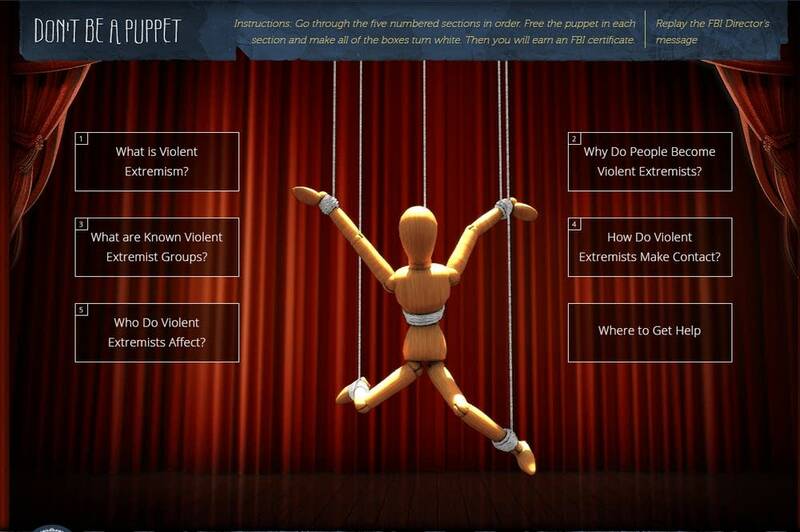 Dubbed "Don't Be a Puppet: Pull Back the Curtain on Violent Extremism," the website includes five interactive sections, such as "How Do Violent Extremists Make Contact?" and "Why Do People Become Violent Extremists?" 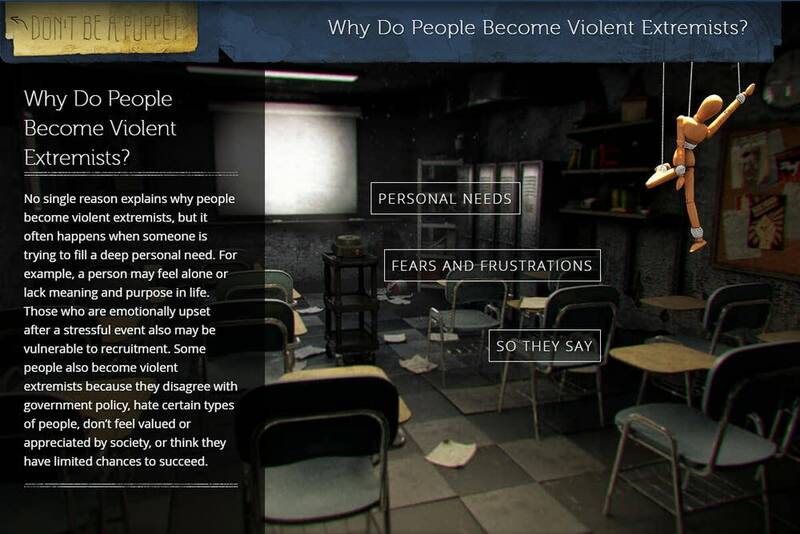 The FBI said the tool was designed to help youth recognize extremist content online and encourage them to be skeptical of anyone who appears to be propagating extremist violence. "The FBI, in conjunction with the Offices of the US Attorney and our law enforcement partners, continue to try and counter the message of those who would radicalize our youth," Minneapolis FBI spokesperson Kyle Loven said in a statement. "The launch of this website is another means by which we hope to thwart the influence of these destructive forces." The FBI's launch of the website is latest of the federal government's multifaceted approach to come up with ways to prevent people from being recruited by terrorist groups overseas. It was introduced on Monday after input from some community leaders, high school students and law enforcement officials. Arjun Sethi, an adjunct professor of law at the Georgetown University Law Center who specializes in counterterrorism and law enforcement, said he raised concerns all three times he was invited to give his feedback on the program over the past eight months. Sethi said he believed that the program is biased, ineffective and is based on flawed theories of radicalization, such as assuming that the radicalization process of an individual can be noticed by others. "I believe this is a dangerous program," Sethi said. "Teachers and students must not become an extension of law enforcement." "The program almost exclusively targets violent extremists arising from the Muslim-American community and generally ignores other kinds of violent extremism," said Sethi, who follows the Sikh religion. The FBI can combat violent extremism through traditional methods of law enforcement investigation, said Sethi, adding that radicalization is a complex and individualized process that teachers cannot identify. "The fact remains that the greatest threat facing American schoolchildren today is gun violence, not Muslim extremism," Sethi said. "Why hasn't the FBI released targeted programs on how to reduce gun violence, gang violence and drugs?" The FBI's countering violent extremism program and its use of informants will "create a fearful environment" at a time when there's a rise in anti-Muslim sentiment in the nation, said Jaylani Hussein, head of the Minnesota chapter of the Council on American-Islamic Relations. "The FBI has a challenging job of protecting our community and they are responsible for leading these efforts," Hussein said. "But, again, these types of websites, these types of efforts will only further stigmatize, profile communities based on their religious identity rather than actual potential threat." There are a lot of unknowns on how terrorism recruitment works because there isn't a typical profile of an ISIS recruit in the U.S., according to the Program on Extremism at George Washington University's Center for Cyber and Homeland, which reviewed more than 7,000 pages of legal documents about ISIS-related charges The program found that ISIS recruits are as diverse as the rest of the U.S. population. "They're old, they're young, they're rich, they're poor," Seamus Hughes, deputy director of the Program on Extremism, told MPR News' Tom Weber Tuesday. "They're college-educated in some cases, and they're high school kids." He said there were 81 people arrested so far in connection with ISIS. "The average was 26, so they tended to be younger," Hughes said. "The vast majority were male. The vast majority were U.S. citizens." Sethi said he was disappointed that the FBI proceeded in launching the program, which he believes will provoke discrimination against Muslims. "I think it's going to exacerbate the problem of violent extremism rather than reduce it," he said.